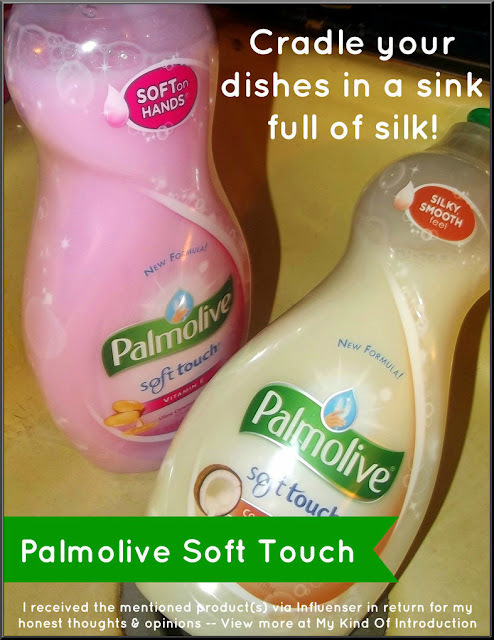 When I received my 2 bottles of Palmolive Soft Touch from Influenser to review, I had many tasks to complete. One of those tasks was to make some type of advertisement featuring Palmolive Soft Touch. The advertisement could be a commercial, new slogan, magazine ad, or anything else I could come up with. I wasn't sure which direction I wanted to go with my ad and it took a couple days before I finally decided on a Magazine Style Ad. Once that decision was made, I began brain-storming. I needed a catchy slogan for Palmolive Soft Touch to help my ad stand out from the crowd, to jazz it up a bit! Palmolive Soft Touch -- Makes your hands so soft, it puts the reward back into Housework! Say "Good-Bye" to stuck-on food and dry hands -- Try Palmolive Soft Touch Today! Palmolive Soft Touch -- Gets the job done in half the time! Palmolive Soft Touch -- Tough on Grease - Gentle on You! Even though I REALLY liked the top slogan, I settled on something different. Would you like to see the finished result? I have to admit, I'm very happy with how my Magazine Ad turned out. It took a bit of time to plan and complete but now that it's finished, I would love to hear your feedback on how you think my Palmolive Soft Touch Ad turned out. Could you picture my Ad in one of your favorite magazines? Don't forget to check out my full Palmolive Soft Touch Review as well!